Here in Thunder Bay, we have a wonderful and diverse community of artists. 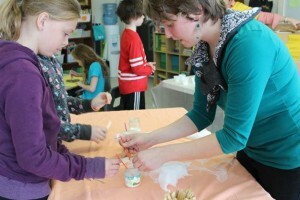 As a part of our blog, we’re offering a glimpse into the creative worlds of Northern Ontario artists who teach in the schools and community. To start, we’d like to introduce you to Carol Kajorinne. She’s a new generation visual artist who has been working with CAHEP for the past four years. 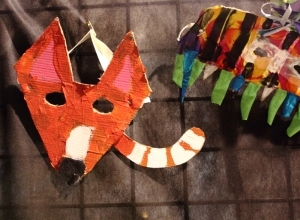 She has the ability to take almost anything (fabric, recycled materials, and metal…just to name a few), and turn it into art with the children and youth she works with! She has been active in our Artists in the 5th program, and most recently has played a key role in our Neighbourhood Arts Engagement Program, building relationships with children at Community Action Group in the Blucher Picton Windsor neighbourhood using art. Recently, Carol and her partner Kriev, were awarded a CEDC grant to start-up their own metal-working studio, Pike Lake Forge! Her generous spirit and imagination continue to breathe life into our City’s creative community! Thank you to Carol for giving us a peek into her life as an artist in Thunder Bay. CAHEP: Tell us a bit about yourself. What inspired you to work as an artist in the schools/community? Carol: I grew up on Pike Lake, on the same land where my Mummu (my late great grandmother) grew up. My family and I would often walk or boat down to Mummu’s camp where we would play canasta, sauna and swim. I was always an artistic child, I recall being asked in grade one to draw Franklin the Turtle for classmates. And although I was always artistic, I was a well rounded student, and could do anything I put my mind to – which made it confusing to know what field I should study. My Father operated his own Backhoeing and Hauling company, so I grew up helping around the shop, was familiar with tools, and in high school I took tech classes. Unfortunately at the time, I actually had trouble with my hands and I could use a pencil, computer and do simple tasks but anything that took strength was impossible. And by that time I had already decided I would pursue a career as an artist. So many of my classmates had to do the hard hand work for me (like cutting tin with snips). The experience of basically losing the ability in my hands, made my gift a little more present in my mind, and encouraged me to do what I can, while I can, with the body I have. Now, I work with the heaviest material out there: metal! It keeps me active, healthy and focussed. CAHEP: Who’s your art hero? Carol: I never really think of any one particular person as being my hero. I also never have had a favourite colour. But if I have to narrow it down, I’d say the artist who has impacted me the most is Bob Marley. His music has lived long past his life, and has been something created in extension from himself – his music is almost like a being on its own. As for visual artists, I love artists that are led by emotion, so Emily Carr’s work amazes me, it’s very alive. And as for a metalworker – Samuel Yellin is fantastic and is one of the most respected smiths from the USA. CAHEP: What do you love most about what you do in schools & the community? Carol: I love sharing some of the tips I learnt in University. Simple things that anyone can grasp, but often never consider. While teaching I feel like I have a chance to share some skills that will improve technique and the way people create, and also the way we think about creating. One of my favourite simple mediums to create with is pencil crayons. Everyone always keeps the colours separate, when really you can blend them a lot like paint. 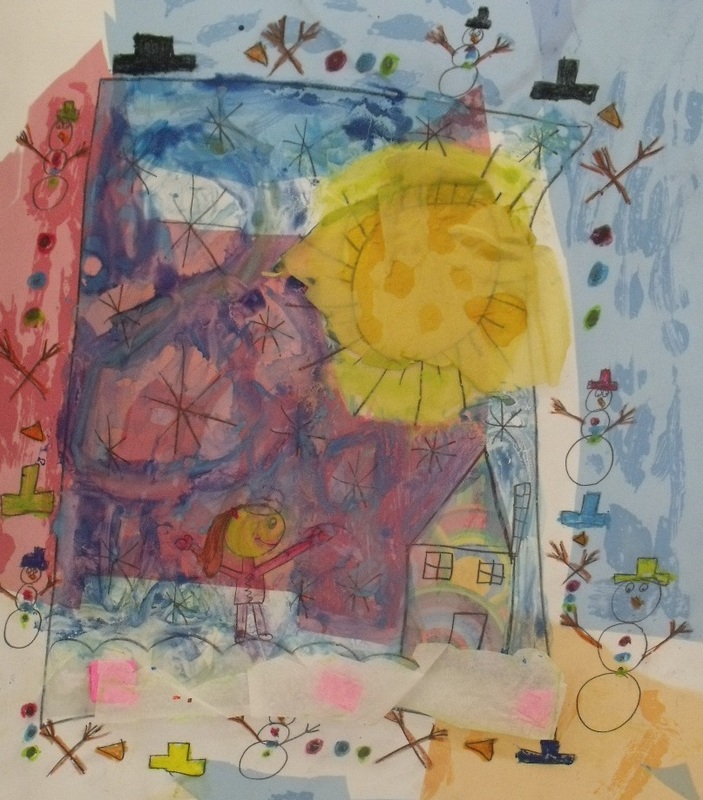 Another fun project I’ve done through CAHEP was working on mylar – the students were encouraged to think about a drawing as a 3D object that you can build off of, flip over and draw from the reverse side, and simply layer imagery through mixed media collage. CAHEP: Where do you turn for inspiration when planning an arts education project? Carol: I often turn to the classroom educator for some ideas of what they have in mind, what they have done in the past, what they wish they could do, and what they think the learners would enjoy and most benefit from. We usually brainstorm together and I draw some ideas from there. I enjoy working in a three-dimensional mediums and incorporating recycled fabrics, papers, and packaging, which can influence the project. I try to ensure the students and educator are learning a new creative technique, or a new way of applying a familiar art form to their repertoire. CAHEP: How do you create a balance between your own creation and your arts education work? Carol: I am a sculptural thinker, and so I bring my sculptural techniques into the classroom. It keeps me excited and is something students rarely do. I’m also currently developing a way for my partner Kriev and I to bring blacksmithing into the classroom. This new endeavour will keep us focussed on our career and medium of choice, and will encourage youth to keep blacksmithing alive. CAHEP: When you’re not engaging children and youth in the arts, what are some of your favourite pass-times? Carol: Playing music – I haven’t done enough of it in the past couple of years. But I do play piano and love to sing. Sauna is a must, and of course swimming. And my favourite thing to do is all three at the same time with Kriev, my niece, and nephew. I love nurturing their young musical talent and making songs and sounds in the sauna. I also love spending time outside, on the lake and going for walks. Otherwise, all I do is work with steel, and drown myself in transforming Pike Lake Forge into an operating business. CAHEP: Can you share a photo of a space that inspires you? 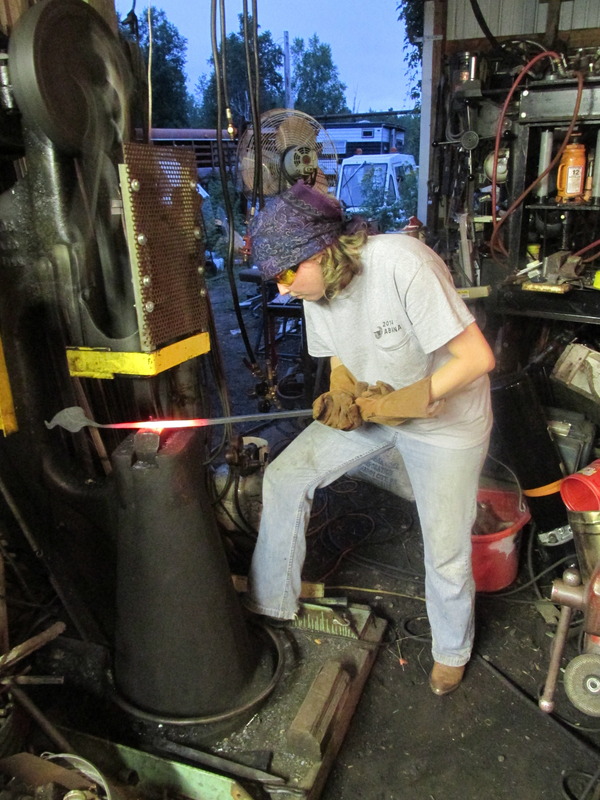 Carol: Here is a picture of me working with a Power Hammer. Kriev and I (aka Pike Lake Forge) were lucky recipients of a Business Starter Grant from the CEDC, and are currently shopping for one of these of our own! This picture was taken in our mentor Dave Hanson’s shop near Duluth. I met Dave when I took his Blacksmithing course at the North House Folk School in Grand Marais. I use a power hammer to forge Leaves. Leaves for hooks, towel racks, toilet paper holders – anything. I enjoy watching the metal move and find it fascinating how in order to forge a leaf, you first forge a bud before spreading the leaf. Then you hand chisel the leaf veins and shape the leaf to give it life. I foresee exploring plants deeper through the method of forging. By the way, Pike Lake Forge is named in honour of my Mummu, and is my effort to “keep Pike Lake alive”, no matter where I am. If you’re a Thunder Bay or Northern Ontario artist who works in schools or the community and would like to share your work on our blog, please send us an email!